Raghavendra Swamy visited several holy and pilgrim places in India and many of them such as Tanjavur where he was given Sanyasa, Kumbakonam where he studied, Bichale in Raichur district where he stayed with his favourite disciple Appanacharya for years and Mantralaya where he entered Brindavana is well known. However, there are many places and temples which are associated with Raghavendra Swamy and some of them are not as well known as the places mentioned in the opening paragraph. One such place is Kakkalur in Tamil Nadu. Kakkalur has a small but beautiful temple dedicated to Anjeneya or Hanuman and this is where Raghavendra Swamy prayed regularly. What makes the temple all the more important is that the Anjeneya idol was installed by none other than Vyasa Raja or Vyasa Theertha, the previous avatar of Raghavendra Swamy. Vyasa Raja was born in Bannur near Mysore and he first studied under Bramanye Theerta at Abbur near Chennapatna. Bramanye Theertha nurtured Vyasa Raj, then known as Yathiraja, for a few years before sending him to his cousin brother Sripadaraja of Mulabagal (Both Bramanye Theertha and Sripadaraja were born in Abbur Doodi and their mothers were sisters) for further studies. Vyasa Theertha, during his sanchara, visited Kakkalur among other places in Tamil Nadu, and installed the idol of Anjaneya here. This is one of the 732 Vyasa Prathistha Hanuman idols in India. After Vyasa Theertha entered brindavan in Nava Brindavana near Hampi in 1539, he was reborn as Raghavendra Swamy in 1595 in Bhuvanagiri, Tamil Nadu. Raghavendra Swamy is believed to have spent several years at the KakkalurTemple and prayed to Anjeneya. There is a small plaque in the temple testifying to this fact. 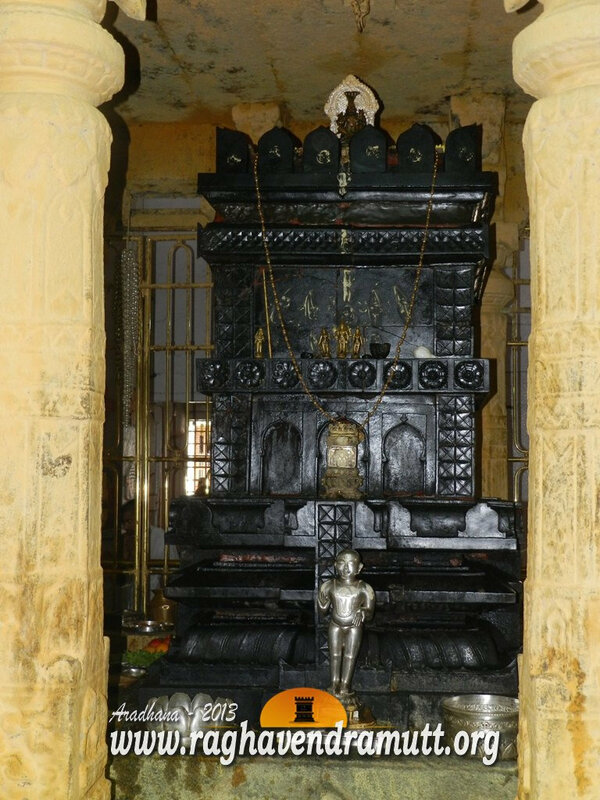 The temple has a picture of Raghavendra Swamy placed at the spot where he sat and meditated and also an inscription containing verses he wrote about Kakkalur Veera Anjaneya. The verses embedded in a wall on granite and are etched in Tamil. The Veera Anjaneya is about nine feet in height and he is in a standing posture, facing north. Hanuman’s tails falls is seen raised over his head and this is a sing of Vyasa Prathistha Hanuman. The temple is just about 500 metres from the main road and it is just three kilometers from Tiruvellore. The temple is believed to very old, and some say it is more than a thousand years, before Vyasa Theertha installed the deity of Hanuman. This is known as VeeraAnjeneyaTemple and Tiruvellore is well connected by road and rail networks. Another specialty of the temple is that the Neem tree is entwined with a peepal tree and this is considered to be auspicious. People believe that if they stand between the entwined trees and seek a boon from Anjeneya, it will be granted. There is a Ganapathy shrine next to this temple. Kakkalur is easily approachable from Chennai and its just 40 kms away. Take a local train from Chennai Central and get down at Putlur, a station before Tiruvallur. Putlur station comes after Sevvapet road station. Kakkalur is about an hour from here. From Chennai, take S571 from Broadway and it takes two hours to reach the destination. The temple is open from 6 a.m., to 1 p,m., in the morning and again from 3 p.m., to 8 p.m,, in the evening. Incidentally, the 40-feet Panchamukhi Anjeneya is nearby as is several other temples.